Tuesday January 1st 1901 It was a bright cold day with fine roads. Will and I went to town transacted some business and went over to Woolfs for dinner. Frank & his wife go home tomorrow. We had a very pleasant day. Came home before night. Mort hauled oats to Hill Siding Wednesday January 2nd 1901 Mort helped me wash and Will took another load of oats to Hill Siding. In the afternoon they put on two big loads of corn fodder to take tomorrow. I wrote to Mother in the evening. Weather warmer. 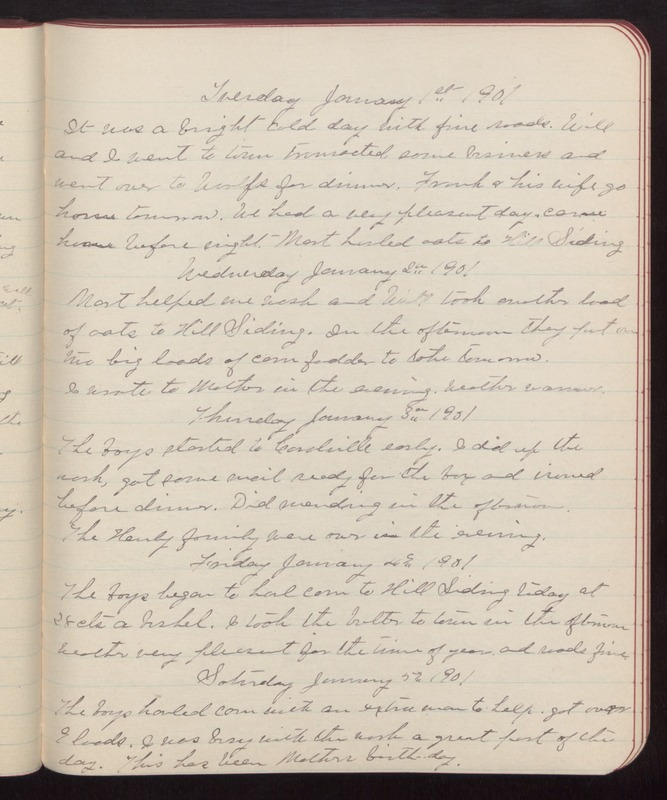 Thursday January 3rd 1901 The boys started to Coralville early. I did up the work, got some mail ready for the box and ironed before dinner. Did mending in the afternoon. The Henly family were over in the evening. Friday January 4th 1901 The boys began to haul corn to Hill Siding today at 28 cts a bushel. I took the butter to town in the afternoon Weather very pleasant for the time of year. and roads fine. Saturday January 5th 1901 The boys hauled corn with an extra man to help. got over 9 loads. I was busy with the work a great part of the day. This has been Mothers birth-day.